Prosciutto is a traditional Istrian delicacies obtained by a special drying method and is considered one of the largest gastronomic delicacies of this region. Although traditionally the prosciutto is prepared from pork, in the Gatto Nero konoba we decided on a different approach. 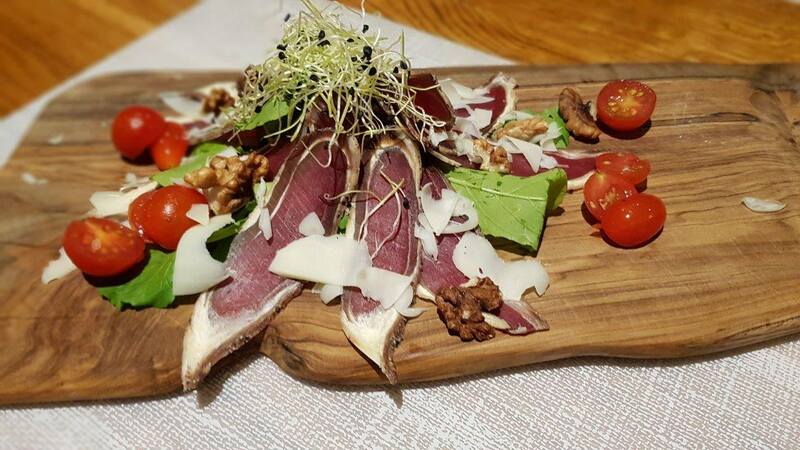 We always try to offer our guests a special gastronomic experience so in our rich offer you can now find lamb prosciutto from the island of Pag, whose specific flavors and pleasant meaty tastes will surely impress you. This is the exclusive offer of the tavern Gatto Nero, which in Istria alone offers its guests the opportunity to enjoy the sensational tastes of this special dry meat product. It is made from the finest lambs, with a moderate addition of sea salt, and then dried and matured in natural and strictly controlled conditions to achieve the optimal texture and meet the high tastes standards by which this specialty is known.